Kimberly is just eleven when she and her ‘Ma’ emigrate to the States from Hong Kong. It has long been a dream of theirs to live in America and chase that American dream. They arrive in New York with little more than the clothes on their backs and the promise of a new life. Ma’s older sister, Paula, has been living in New York with Uncle Bob for several years and it is because of her sponsorship that Kimberly and Ma are able to come. But don’t get the idea that Paula is a benevolent soul; she’s not. She puts Ma to work in the clothing factory Bob manages – a sweat shop – and sets her sister and niece up in an apartment so filthy, cold, and vermin infested that the building has all but been condemned. In fact, every other tenant has moved out in anticipation of the building’s eventual demolition. 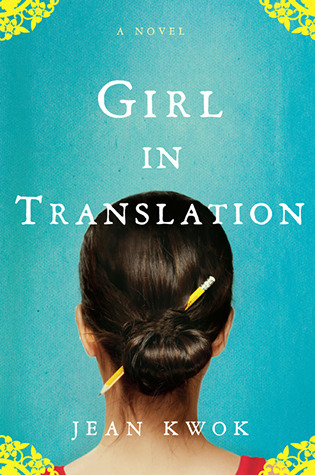 Girl in Translation is the story of Kimberly’s adolescence. It’s about her tenacity. If she weren’t so intelligent, her story might have had a different conclusion, but she’s really smart and it’s those smarts that propel her past many of the obstacles poverty throws in her way. Those of us who live a comfortable existence likely have very little notion of how incredibly difficult it must be for people who come to, let’s say, North America and try to start a new life. Immigrants often don’t speak the language. They don’t understand how anything works. They have no way of advocating for themselves. Kimberly and her mother also have to contend with Aunt Paula who is petty and stingy and jealous of Kimberly’s smarts. There are moments of kindness in Kimberly’s story. She makes a true friend early on. She finds success academically. She makes her way. But there are significant sacrifices, too. Like Kimberly, Kwok was born in Hong Kong and immigrated to New York City. She, too, worked at a sweat shop. She, too, was smart. At about the two third mark in the novel I started to feel a bit…I don’t know…disappointed. Kimberly’s story remained interesting, but I really felt as though this was a memoir dressed in a novel’s cloak. I can’t quite explain why, but I didn’t feel like I was living the story anymore, I felt like I was being told the story. And then…that thing I HATE. Flash forward twelve years and let’s see where all the characters are. Nothing about that epilogue – over-wrought and schmaltzy as it was – seemed to fit the rest of the novel. That’s my own personal niggle, though. The novel has been praised all over the place and I suspect the vast majority of readers will really enjoy it. This entry was posted in Uncategorized and tagged 2013, book club pick, Book Review, literary fiction by Christie. Bookmark the permalink.